New to ChildBrite's line of Sand and Water Activity Centers is the Deluxe Sand and Water Activity Center!! Massive storage underneath! Being equiped with a clear liner allows a view from the side to see all what is going on! Includes white plastic lid with a stability system with wingnuts to secure the liner and lid. 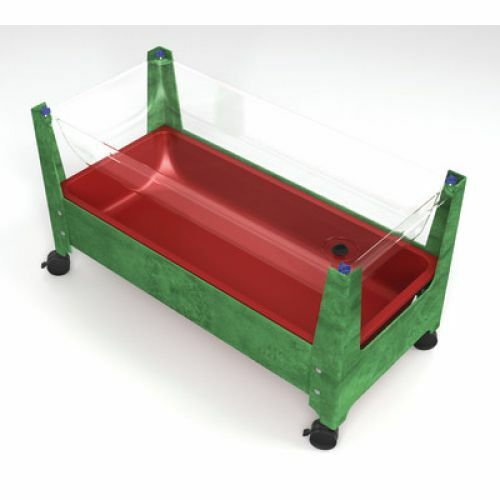 Available in 2 storage configurations: (1) Long 6” Deep Red Liner or (2) Two 4” Deep Drip Pans. Blue, Sandstone, or Milk Chocolate frame with four 3” locking casters. Assembly required. 46"L x 21"W x 24"H.